Eloise of Coulter joined the SCA in 1987 as a student at the University of Connecticut. She is a Mistress of the Laurel and Pelican, and hold the King's Order of Excellence, amongst other awards. She has been a scribe of the East Kingdom since approximately 1988, holds her Laurel for calligraphy and illumination, and at one point was sufficiently prolific to be officially installed as the kingdom “Scroll Fairy.” Since then, modern employment, home ownership, and parenthood have slowed down her production level, and she is currently more interested in obsessive authenticity than quantity. Eloise began in the Society in the Canton of Fennbrycg of the Barony Beyond the Mountain (northern and eastern Connecticut.) After leaving college, she returned to her home in the Canton of Ravenhill in another portion of the Barony, and remained there for almost ten years. At that point she moved to the Barony of Delftwood (Syracuse, NY) in what was then the Principality of Aethelmearc. Luckily for everyone involved, modern employment issues brought her back to Connecticut, to the Barony of Dragonship Haven (southeastern Connecticut) where she and her husband lived for close to ten years. Employment and home ownership led her back to the Barony Beyond the Mountain, this time in the Canton of Bowman’s Rest. She is a little disappointed that she never lived in the Canton of Dragon’s Aerie to “complete the set,” - but not enough to move. She has served as the Baroness of the Barony Beyond the Mountain, seated with her husband, Baron Dorian of Lewes. Eloise was born in Coulter, a village in Lanarkshire, Scotland, lying close by the town of Biggar and the River Clyde, and ruled by Patrick Fleming, the Lord of the Barony of Biggar. Daughter of a prosperous sheep farmer, her brother is significantly older and the sole heir of her parents. 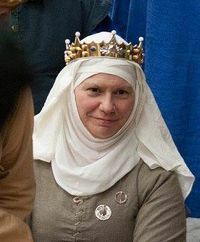 In 1336 to hedge the family bets during the turmoil of the second Scottish war of independence, her family decided to marry her to a member of the English forces then “visiting.” Later when he returned to his home of Lewes in Sussex, England, she went with him and manages his property and household while he fights in Edward III’s wars in France as part of Earl John de Warenne’s and then Earl Richard Fitzalan's levy. 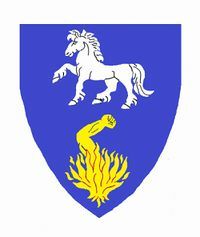 Arms: Azure, in pale a colt passant argent and an arm embowed palewise issuant from flames Or. Eloise has a broad spectrum of interests. Her first love will always be calligraphy and illumination, but she will attempt any craft that catches her interest. Other arts that have struck her fancy over the years have been embroidery, lace making, wood block printing, etching, pysanky, glove making, shoe making, lampworking, basket making, woodworking/furniture making, and weaving on tablet looms, rigid heddle looms, and floor looms. She has a decent working knowledge of brewing, but does not do so herself. She hopes to explore many of those topics further. She sews well enough to clothe herself and her family, but finds little enjoyment in it. Eloise was apprenticed to Mistress Daryl of Avalon, whose Laurel was Master (Saint) Robert Whitcombe of Brandywine. Her apprentice sister was Mistress Amber Sturmwolfe. Eloise has had two apprentices: Mistress Anne Elaina of River’s Bend, and Mistress Michel Almond de Champagne. Both later went on to serve as Tyger Clerk of the Signet. She has not taken any protégés. Eloise and Dorian have a daughter. It is so unlikely that Eloise will ever be called into court again for an award, that she will go so far as to call it impossible. Go ahead. Try to surprise me. I DARE you. It is worth noting that it is NEVER a good idea to allow Eloise to be a formal member of the event staff. Of the four events she has stewarded, two of them involved sufficiently severe snowstorms that the Governor of the state actually closed the roads, and a third event also corresponded with a severe enough snowstorm to end the event early. Far better to just let her stir things and sweep things and wash things. Black Widow’s Ball; Canton of Ravenhill (New Milford, CT); February, 199?